Wise Care 365 ensure that the computer system is in a stable condition and that the speed level is well maintained even if there are several programs opened or there are active downloading or converting process. 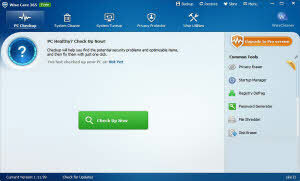 Wise Care 365 is consists of components namely the PC Checkup, Privacy Protector, Wise Utilities, System Cleaner and System Tuneup. These five components perform different functions in the computer system. They work as a scanner to evaluate PC condition, removes registry errors, private information, and possible traces as well as infections. Basically, the program cleans your whole system and protects it from suspicious data. Don’t let your PC to slow down its performance level. Wise Care 365 will be responsible in maintaining the quality of your computer. Download it now and start monitoring and protecting your PC.